So, the beginning of the speech of the best man is your cue that you are going to deliver yours next. It may seem like a very long, nerve-wracking time, but you know you need to stay calm and cool. This may still happen several weeks from now, so don’t feel too worried or excited yet. Here are essential tips you want to learn for sure, which can help gives you confidence and makes you less worried. Don’t think of the speech as just a traditional part of the occasion. You are chosen as a maid of honor not by random selection. Always remember that you have a huge part in the life of the bride and you have to prove that through your speech. It is a privilege and an honor to stand among crowd and tell something that you know about her which some people may don’t. One thing you must keep in mind is to start making your speech beforehand. Do not wait for the last day before the wedding that you think of words to say. It may not be possible for you anymore to have that moment because everyone is going to be a lot busier on the day right before the special occasion. For sure, you need to research some wedding quotes, edit it and let other people read your speech and all those require some time. Plus, it is not a good idea to write a speech when you are very tired and exhausted. This may be optional but it is not a bad idea to have the first line as a joke or a wedding quote. It can make your speech a little bit formal and interesting. You can research one of the best wedding quotes via the Internet or have someone help you make a new and more original line. The first line or the quote you are going to recite is not the introduction. It is a way to catch the audience attention and make you start speaking with ease. So, that should just be a part of the introduction. The rest must include your way of telling who you are, how you are related to the newlyweds, especially the bride, and how excited you are to be a part of that wonderful event. That also implies that you thank the bride for giving you a big and special role. Most importantly, express how privileged and humbled you are to be her friend. You are not expected to tell something about what your life is, who the best man’s current girlfriend, or worse, the bad traits you think that the groom has. 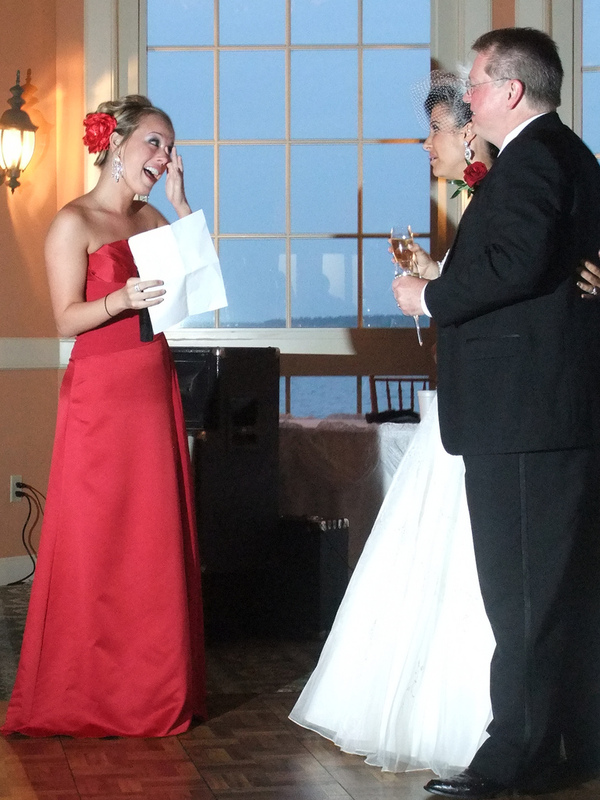 The maid of honor speech usually highlights the bride. Think of a few of the best moments you and your bride had and about the couple’s romantic love story. As a friend who surely cares a lot of the bride as well as her groom, you have a part of giving them advice that helps strengthen their relationship. It may not be particularly a marital advice, but a tip to keep their relationship going stronger and healthier. If you have humor in you, don’t be shy or scared to spill out some laughable lines. It would keep the audience more alert, and make you enjoy the moment while you are standing and holding the microphone. As much as possible, just stay confident to avoid getting nervous, stumbling or sweating too much. At the end of your maid of honor speech, you must raise your glass and have a toast. This is how you congratulate and salute the couple for a healthy marriage and happy life together. In case that you do not drink wine or anything with alcohol content, you can use a glass of juice or soda for the toast. The maid of honor wedding speech should be short but interesting, sincere, sweet and honest. You only have to tell a few but valuable things that the bride and the groom, together with their guests, can hear. It must be also something that the couple, particularly the bride, won’t forget. Lastly, your draft of the speech should be proofread. You can do that or have someone take a look and see if there are errors to correct or words to erase. After the final piece, you should have the time to memorize and practice what you are going to say during your speech delivery. If it takes you only a few minutes to share your speech, it must not be that difficult to prepare. But it is important that you plan it in advance so you can certainly give the best maid of honor speech.